The current co-national leader in the girls 100 meter hurdles coming off a 13.77 wind legal victory at the Texas Southern Relays in Houston last weekend, Alia Armstrong of St. Katharine Drexel Prep is back in her home state this weekend to see if she can lower her season and personal best time even more. An New Balance Nationals All-American in the 60 meter hurdles (4th, 7.75 season best) and Louisiana state champion in the 55 meter hurdles (8.59 season best), Armstrong has made a quick switch to the outdoor season with a very fast time in the finals last weekend at the TSU Relays. While the 2018 USATF National Junior Olympic national champion is the top seed and favorite in the 100 hurdles by a full second, Armstrong's second event in the 400 meter dash will have plenty of competition around her as the third seed at 56.00 among 4 girls with times under 57 seconds led by Kirstin Jones from Tennessee. One of Tennessee's top sprinters, Whitehaven's Kirstin Jones will put her range on display this weekend and be tested against great fields in all 3 sprint races for the 100 meter dash, 200 meter dash, and 400 meter dash. Jones is a defending state champion in the 100 and 200 meter dash with personal bests of 11.75 and 23.94, while her 400 meter dash time is quite comparable in quickness at 55.39. 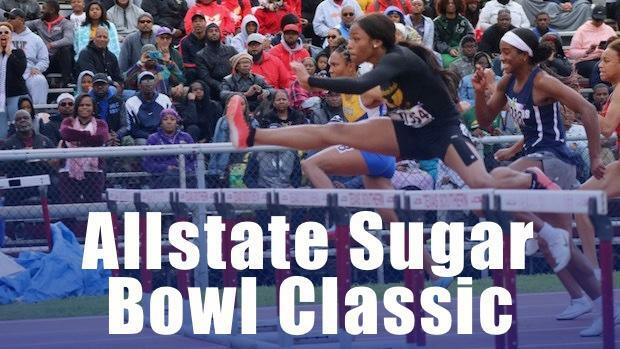 At last year's Sugar Bowl Classic, Jones was a narrow runner-up in the 100 meter dash with a wind-aided 11.75 clocking and third in the 200 and 400 meter dash as well. She will be looking to head back home up Interstate 59 with a victory or two this weekend despite more great competition to face in all 3 events. An incredible young middle distance talent here in Louisiana is John Curtis freshmen Laila Jackson coming off an indoor season capped off winning a state title. She finished off last spring running a 2:19.45 PR as an 8th grader in the 5A state outdoor race for state runner-up honors. Jackson was also a runner-up finish here in last year's Sugar Bowl Classic with a 2:21 performance, so she will be aiming to go for the win as the top seed and go well under 2:20 after running 2:19.58 for 4th place last week at the Texas Southern Relays. One of her top challengers should come from Alabama in Pelham senior Alex Wilkins who has also run 2:19 in the open 800 as well including this past indoor season and finished 3rd in the Alabama indoor state meet, while a state runner-up last spring in the Alabama 6A state race. One of Alabama's elite distance runners, Katie Strozier is coming off an indoor season which she claimed the 6A state titles in both the 1600 meter run and 800 meter run. Her 5:06.73 personal best in the 1600 meter run, leads a Sugar Bowl Field in the event which boasts 5 girls total who have run under 5:20 in the event with Strozier as the top seed. Strozier has been sharpening up speed early in the outdoor season running a 1:19 500, 2:17 800, and 3:00 1000 to prep for this 1600 meter race on Saturday. Some of her top challengers will include Lydia Tankersley (Houston TN), Claire Frazier Bolton (McGill-Toole AL), Madison Walker (Biloxi MS), and Mary Nusloch (Sacred Heart LA). Tankersley ran 5:13 for the full mile indoors this past indoor season at the Tennessee State Meet. In-state rival for Strozier in Bolton has mainly been focusing on the 800 as of late including a swift 2:14 personal best run earlier this month, but could see a time drop from her 5:20 PR. Meanwhile, Nusloch was a Louisiana state indoor runner-up in both the 1600 and 800 meter run this past February and has a prior all-time best of 5:10 in the event. The aforementioned Nusloch is also the top seed in the 3200 at the Sugar Bowl Classic, which she was the runner-up in the race last year with a 11:21 PR and won the Sugar Bowl Cross Country Classic this past fall as well with a season best 3 mile time of 17:48. Nusloch has won a grand total of 12 individual career state titles in Louisiana dating back to her first title as an 8th grader in the 2015 cross country season. She will be the heavy favorite to win the girls 3200 this year at Sugar Bowl Classic, but has a decent field to string along with 8 girls entered at seed times under 12 minutes. Session has been one of Louisiana's top performers in the 300 meter hurdles including an undefeated streak to start this outdoor season and the current state leader with a 45.22 season best. She has been consistent too with all 3 meets to begin the season having run in the 45 second range compared to last year when she only ran in the 46 second range twice. Her top challenger should be Whitehaven (TN) junior Emani Johnson, who actually has broken 45 seconds before with a 44.61 best and also ran 1:04.24 in the 400 meter hurdles last July at the AAU National Club Championships.